All our seed has been planted, grown, cut and processed by the Shirley Family. We have been in the Reg/Cert Seed Business since 1975. The foundation that the business was built on actually began with an FFA project for Joe during his sophomore year in high school, when his Ag teacher encouraged him to plant a new variety of wheat at that time, it was TASCOSA. In 1972, Joe married his wife Ann, a farm girl from Kay County and together they worked to build the family farm. The first farm was purchased and later had the opportunity to purchase additional land from the Grandfather's estate. 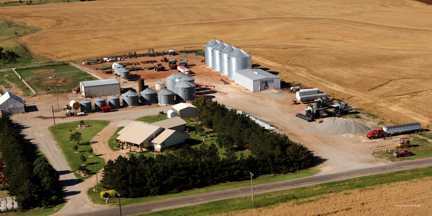 Like most farms in western Oklahoma, farming was not without rials, disappointments, and hardships. Throughout the years, the family has endured complete crop failures due to the devastating hail storms back-to-back in 1980 and 1981. Please give us a call for service. All Contents © Copyright 2018 Shirley Farms. All Rights Reserved.